Categories Announcing New Products & Specials!!! The M-77-D latch is made in house at McKinney Corporation and is constructed of 18 Gage .048 304 2B Stainless with aluminum buttons. This latch has an extra heavy duty spring compared to other latches on the market and meets In-House stringent quality standards. 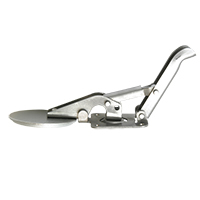 This M-77-D is typically used in Pro Mod Door Latch applications, however, can be utilized for other applications. Please call for quantity discounts and re-sale pricing.